The Brewer's Loft events at The Queens in Mt Lawley have been showcasing a WA brewery on the first Tuesday of the month for the past couple of years. 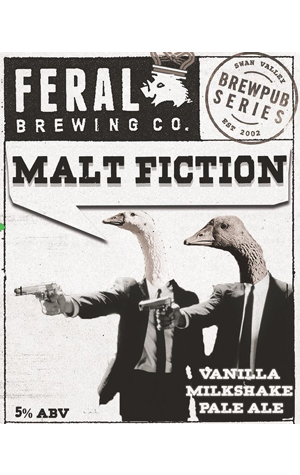 Working with WABA and the Perth Royal Beer Awards, the events have allowed punters to enjoy $5 pints and schmooze with their favourite brewing teams and, when the hosting Feral for the July event, they decided an exclusive collaboration was in order. While workshopping other names, Brewer's Loft brand ambassador Debbie Lilly coined the beer’s name, one that’s a riff on the $5 shake from cult 90s movie, Pulp Fiction. Watching the nitro beer cascade in the glass is something that even the Queens staff stop to admire. Once settled, the marshmallowy head holds vanilla, citrus and stonefruit aromas, while the mouthfeel is suitably creamy, with a soft bitterness, more vanilla and citrus and a tease of tropical fruit. Vincent Vega would be pleased.